Baked Salmon is a simple dish, perfect for a healthy light lunch or dinner. You’re going to love this baked salmon recipe! I like to serve our baked salmon with a side of roasted broccoli or a strawberry spinach salad, and lemon cookies or ginger cookies! Salmon – If you can get wild Alaskan salmon that’s great, totally do that. The best time of year to look for it at a reasonably price is July through September. If wild salmon is cost prohibitive, farm raised salmon is delicious too! Oil – I like a mild olive oil for this baked salmon, but any vegetable oil will work. 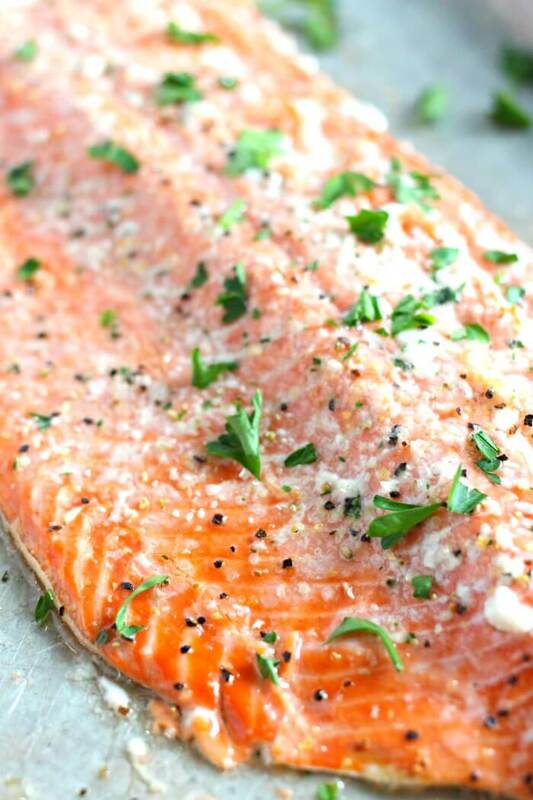 Seasoning – Salt and pepper, garlic salt, or seasoned salt are perfect simple seasonings for your baked salmon. I also like to sprinkle some fresh parsley at the end for a pop of color. How long do you cook salmon in the oven at 350? 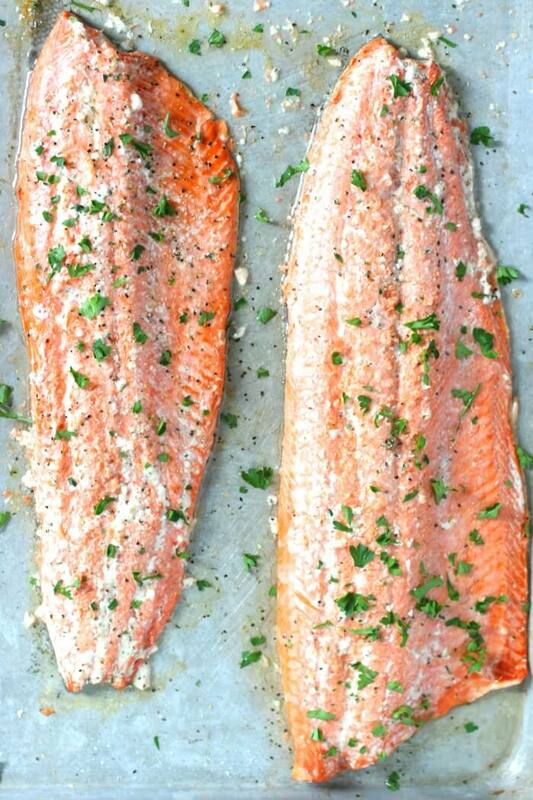 Baked salmon takes about 12 – 15 minutes to cook at 350 degrees. 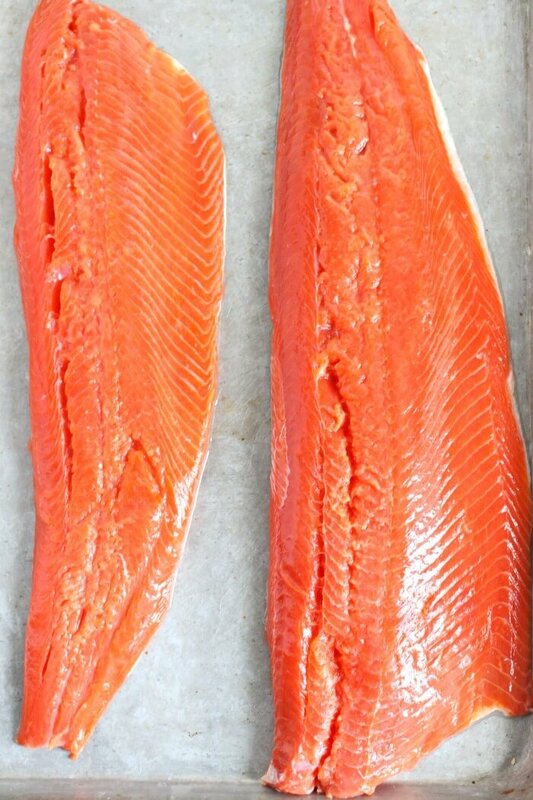 The time can vary some depending on the thickness of your salmon filets and whether you’re baking the filet whole or cutting it before baking. The baked salmon pictured in this post was baked at 350 degrees and it took exactly fifteen minutes. How long do you bake salmon in the oven at 375? At 375 degrees you’ll want to bake your salmon for about 11 – 14 minutes. Again, this can very depending on how thick your salmon is and whether it’s cut before baking. The higher the temperature you cook at, the faster it will be finished. The cook time for baked salmon does not vary much between 350 and 375. How long do you bake salmon in the oven at 400? At 400 degrees, salmon will bake in about 10 – 12 minutes. Keep an eye on the salmon because it can overcook quickly at the higher temperatures. How long does it take to bake salmon at 425 degrees? It takes approximately 9 – 11 minutes to bake salmon at 425 degrees. Some folks believe that baking salmon at a higher temperature will keep the white stuff from oozing out as it bakes, but this is actually not true. Baked salmon is very healthy. It is rich in omega-3 fatty acids, it’s a great source of lean protein, it is high in B vitamins, and a good source of potassium. If you’re following the Weight Watchers diet, baked salmon is a zero point food. Is salmon baked covered or uncovered? In this baked salmon recipe, we baked our salmon uncovered. Salmon can be baked both covered or uncovered. 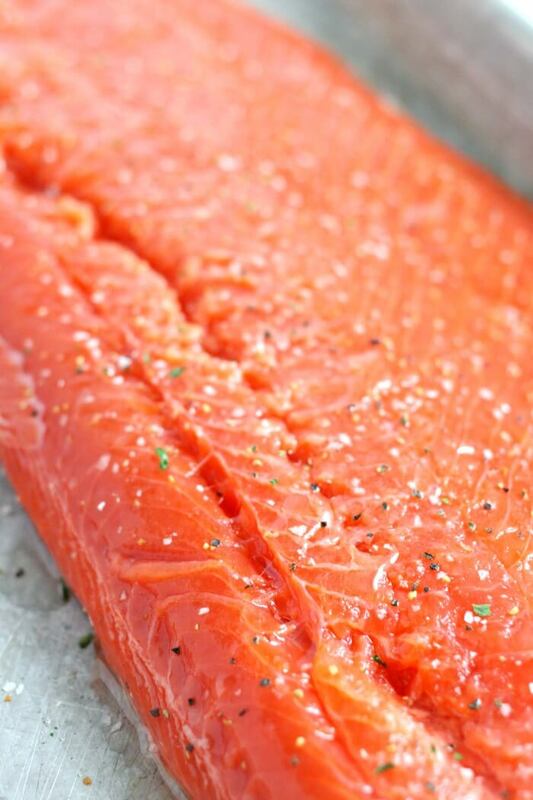 If you are worried about the salmon drying out as it bakes, covering it with foil can help keep the moisture in. I find that it is usually unnecessary to cover salmon while baking. We seasoned our baked salmon with garlic salt and pepper and finished it with a sprinkle of fresh parsley when it came out of the oven. If you want something a little fancier, try our salmon marinade or a honey garlic salmon. What is the white stuff that oozes out of baked salmon? The white stuff that oozes out of baked salmon is coagulated protein known as albumin. It is completely harmless and not something to worry about at all. Albumin is not the same as albumen (the term for egg whites). Some folks believe the key to keeping the white stuff from oozing out of salmon is to bake it at a higher or lower temperature, but this is actually not true. 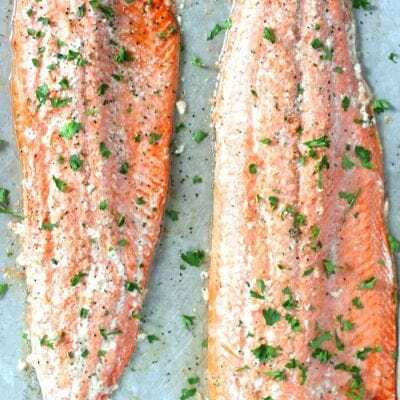 There is no sure fire way to prevent the albumin (white coagulated protein) from seeping out of salmon as it is baked, but you can minimize it with a simple salt water brine. Add 1 – 2 tablespoons of salt per cup of water, and let the fish sit in the bring for about ten minutes before baking. As you can see from the pictures of our baked salmon, I don’t bother to brine. The white stuff doesn’t bother me or my kids, so we don’t add the extra work. But if I was making baked salmon for guests, I would brine first! Can baked salmon be frozen? 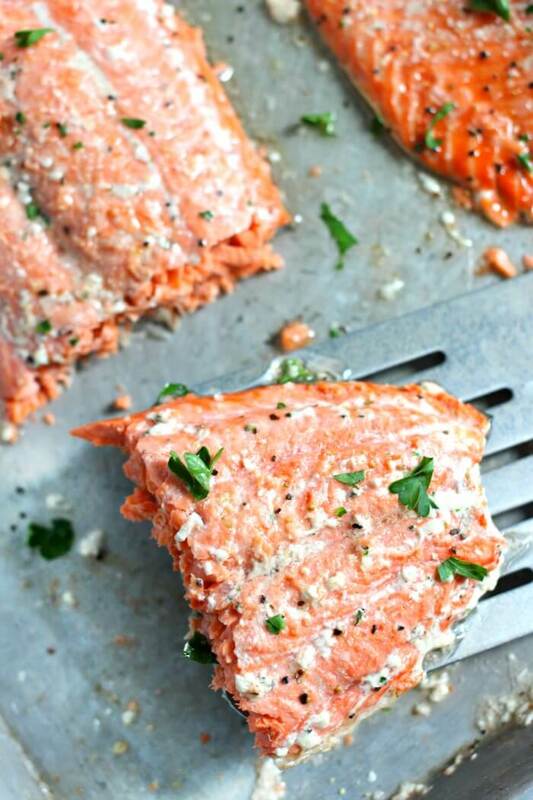 Baked salmon can definitely be frozen! We often purchase large amounts of salmon from our market when it goes on sale and bake it all up right away, then freeze what we don’t eat. 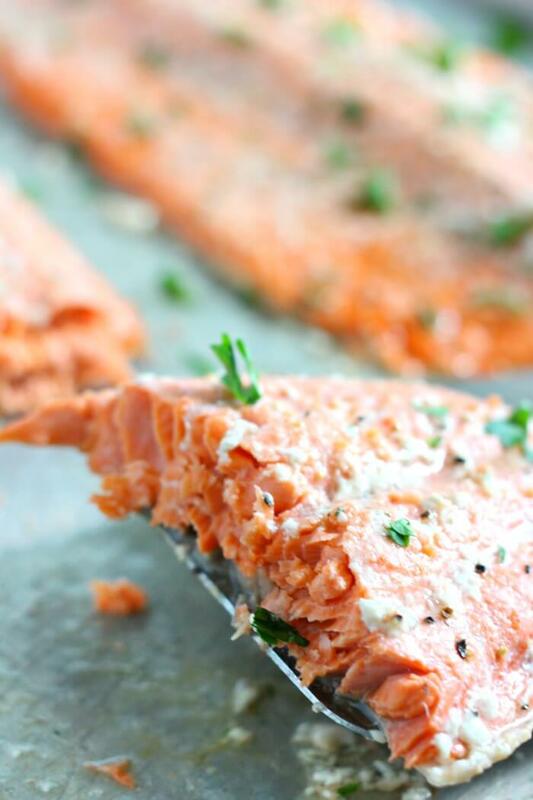 Frozen baked salmon can be reheated to eat as is, or turned into smoked salmon dip, or salmon patties! I like to reheat our baked salmon in the microwave to keep the dish from drying out. You could also steam it, but I would not recommend reheating in the oven. Baked Salmon is a simple dish, perfect for a healthy light lunch or dinner. 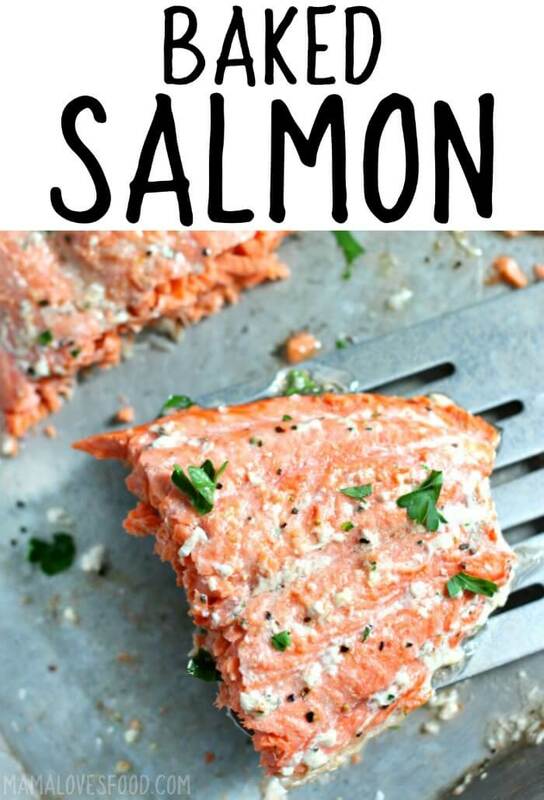 You're going to love this baked salmon recipe! 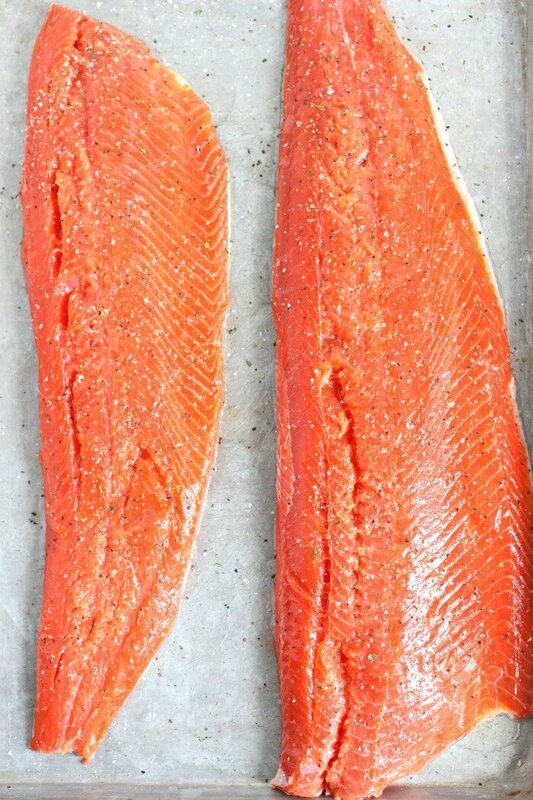 Place salmon skin down on a baking sheet. Drizzle with a small amount of olive oil, then sprinkle with salt and pepper. Bake at 350 degrees for 12 - 15 minutes, until salmon is finished to your liking. I’m a big fan of salmon and love all the health benefits from eating salmon at least once a week. I usually grill mine since our weather allows for it 365 days a year but I like baking it if I am putting some sort of sauce on it. Your tips about how to cook are great and the fact that you let the family put on their own toppings is a great idea. I love that you tested all the cooking times! We have baked salmon a few times a month – so good!